Ana Paula Cortez, a Portuguese teacher at Graded, The American School of São Paulo, got her 7th and 8th Grade students excited about practicing the target language during a Life Cycle unit. Students were learning vocabulary words and traditions around the birth of a child, their school and college years, work life and retirement. Ana Paula designed a project titled: “De volta para o futuro” (Back to the Future). 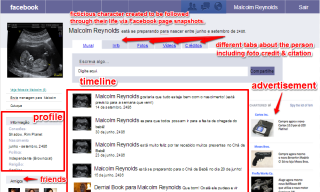 She asked her students to create a character and fake Facebook pages to accompany the character throughout his/her life. Ana Paula Cortez translated the template into Portuguese and shared the file via Google Drive with her students. They each made their own copy and shared it back with their teacher. Students created a page announcing the birth of the “person”, during the infancy/childhood, High School time,adulthood and retirement age. Este projeto foi muito divertido. Foi muito legal como criamos uma pessoa e seus amigos e familiares. Foi como fazer uma história. Eu aprendi muito e espero que possamos fazer outros projetos como este.